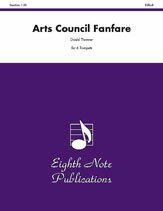 The Arts Council Fanfare was commissioned by the Provo Arts Council in Provo, Utah. This piece works extremely well as an opening crowd grabber. The premier performance was on one piccolo and five fanfare (or herald) trumpets with fancy banners to open a pop concert. Unforgettable!